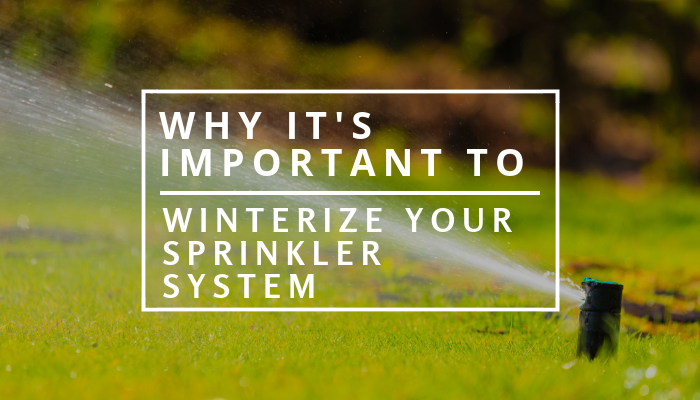 If you haven’t winterize your sprinkler system this year yet, now’s the time to do so. And we mean right now. Based on our local Andover, MA history, freezing temperatures can start in early November. In fact, in 1989, temperatures reached an all time low of 4° one day in November. Last year we wrote a brief warning post about why winterizing your sprinkler system is a good idea. Now that Fall is here and Winter is just around the corner again this year, we want to expound on that a little more. It is important to prepare for winter in every aspect of running a home. As lawn experts we can assure you that these precautionary measures should also extend to your lawn. The biggest threat Winter can bring to your sprinkler system is potential pipes bursting due to frozen water expansion. When water freezes, it expands by approximately 9%. Meaning if your pipes are still full of water by the time freezing temperatures hits, that water will freeze and expand taking up a much larger space than it was before. Because pipes are not made of rubber, something’s got to give. Many problems can ensue such as fittings, sprinklers, valves, pumps, pipes and other parts of your irrigation system bursting and/or breaking. Fortunately, underground piping tends to be pretty well insulated by soil however, underground pipes can still burst if the conditions are right. In the unfortunate event of freeze damage to your sprinkler system, pipe bursting is but one of your concerns. You now have to be on the lookout for a possible flood. As freezing temperatures finally begin to warm up and ice begins to melt, you’ll start noticing leaks. The pressure of more water coming into the line can cause further pipe damage which can cause massive flooding in your yard as well as in other parts of your pipe system. You’ll have a nightmare on your hands. Did we mention the cost? Repairing freeze damaged parts can cost a significant amount of money. Why is that? Leaky valves, fittings, and other parts must all be replaced. Any broken section of piping must also be replaced. It’s not as simple as glueing things back together. When you’re dealing with water and pipes, materials and couplings must be tightly fitted together without cracks or strain in order to prevent leaks and water waste. The cost can vary greatly ranging from less than $100 to upwards of $1000 if underground damage is present. If digging is necessary to make repairs, this will cause repair costs to skyrocket, not to mention the amount of lawn care that needs to be done after repairs are made. If you’re thinking about taking your chances by not putting effort into winterizing your sprinkler system, don’t. It’s not worth the heartache and potential monetary loss. Talk to our team about winterizing your sprinkler system before Winter hits. We’d be happy to walk you through our process and how we can help you avoid these costly repairs in the long run. Trust us, you’ll be glad you did. No Replies to "Why It's Important to Winterize Your Sprinkler System"